Would Your Guests Enjoy a “Little House”? 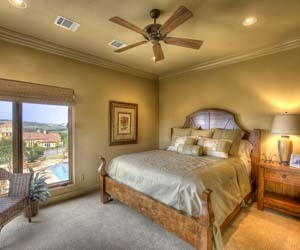 Austin custom homes to compact active adult homes. Casita means “little house” in Spanish. These little homes are separate little apartments or suites that are attached to the main house and provide your guests with complete privacy. Austin custom home builder Sterling Custom Homes has been building Casitas for several years. Some custom home buyers request a secondary interior access point into a hallway of the main home. Others find that in-laws, guests or college student children prefer the privacy of the single exterior accessibility. Even empty nesters are finding uses for the casitas as a resort-style retreat for out of town guests or a home for live-in caregivers. Since they built their first casita, Sterling Custom Homes has continually received requests for the concept in new home designs. For Sterling’s custom home buyers, the casitas are usually a guest suite rather than a complete apartment. They may be finished with additional features, such as sitting areas, coffee bars and luxury bath and shower spaces, to complement the large sleeping area.